KONG Easy Treats are delicious and a convenient way to reward your dog. 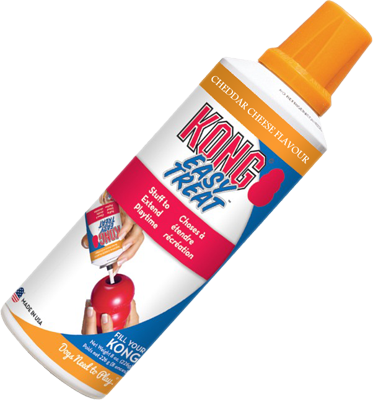 The unique and convenient spray can is ozone-friendly and has a built-in nozzle perfect for applying small amounts of Easy Treat paste into any rubber KONG toy. Composition: Milk and Milk Derivatives (Cheddar Cheese 30%), Oils and Fats, Various Sugars, Derivatives of Vegetable Origin, Minerals. Technological Additives: Preservatives (Sodium Phosphate, Lactic Acid, Sorbic Acid). ; Sensory Additives: None stated; Nutritional Additives: None stated. Analytical Constituents: Protein 4%, Crude Fibres 1%, Crude Oils and Fats 20%, Crude Ash 6%, Moisture 54%. Feeding Guide: Use as a Treat. Never use as a replacement for daily feed.